Our 10 Week game is just like our flagship full season game, but gives you 7 extra weeks to sell your tickets before the sweepstakes begins. This is really helpful for schools and other organizations that start fundraising in the late summer or fall. We offer both a $20 and $10 ticket for this fundraiser. Get all the details below. This short 2 minute video is a great way to learn how the FootballMania game is played. An exciting game based on professional football! FootballMania is an exciting sweepstakes fundraiser based on professional football. All sweepstakes game cards have an equal chance to win prize money based on the performance of the random football teams printed on the back. Game cards contain 3 random teams in each of the last 10 weeks of the pro football season (you get 3 new teams each week). To play the game, participants simply add up the points scored by their 3 teams. Every week, the 25 highest scoring game cards and the 5 lowest scoring game cards all win prizes. In addition, two grand prizes are awarded at the end of the season. There are 4,960 unique game cards, each of which has a minimum 1 in 17 chance to win a prize during the season. View detailed prize money amounts below. Determining your profit with FootballMania is easy. To raise money, you sell CharityMania Tickets for $20 and keep 70% of the money you collect. Ticket holders receive $20 worth of premium digital music downloads (read why the music is important for this fundraiser), and they are entered into the FootballMania sweepstakes. Sell 10 tickets or 10,000 tickets… you make $14 on every ticket. It is really that simple. You determine how many CharityMania tickets you need and then purchase them from us for 19¢ per ticket (to cover the printing costs) plus shipping and a $10 handling fee per order. You then sell each CharityMania ticket for $20. With each sale you pay $6 to CharityMania to cover the costs of the music downloads, the management of the sweepstakes, and any prize money your game cards may win. The remaining $14 is your profit! Sell 10 tickets or 10,000 tickets… you pay $6 for only those tickets you sell. View our Financial Flowchart for more details about payments and when they are made. Determining your profit with FootballMania is easy. To raise money, you sell CharityMania Tickets for $10 and keep 65% of the money you collect. Ticket holders receive $10 worth of premium digital music downloads (read why the music is important for this fundraiser), and they are entered into the FootballMania sweepstakes. Sell 10 tickets or 10,000 tickets… you make $6.50 on every ticket. It is really that simple. You determine how many CharityMania Tickets you need and then purchase them from us for 19¢ per ticket (to cover the printing costs) plus shipping and a $10 handling fee per order. You then sell each CharityMania Ticket for $10. With each sale you pay $3.50 to CharityMania to cover the costs of the music downloads, the management of the sweepstakes, and any prize money your game cards may win. The remaining $6.50 is your profit! Sell 10 tickets or 10,000 tickets… you pay $3.50 for only those tickets you sell. View our Financial Flowchart for more details about how and when payments are made during the fundraiser. 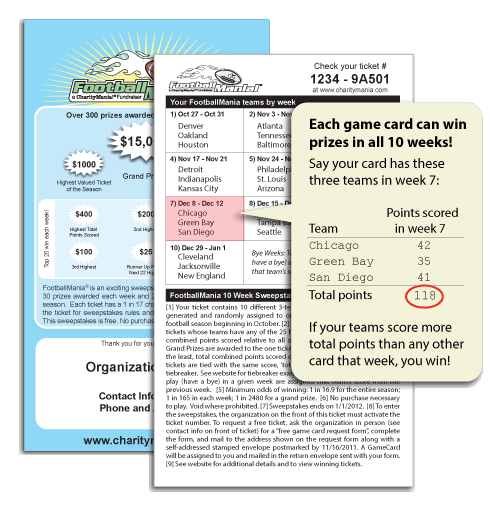 Sweepstakes participants can win $1,000s in cash prizes based on the number of points scored by the football teams printed on the backs of their Sweepstakes Game Cards. Each week CharityMania calculates the winning game cards. We then send you the prize money so that you can send it to the winners with a personalized letter thanking them for their support. Every week, the 25 highest scoring game cards, and the 5 lowest scoring game cards all win prizes… a new chance in each of the 10 weeks of the sweepstakes! There are 4,960 unique game cards, each of which has a minimum 1 in 17 chance to win a prize during the season. If your organization wants more winners, we also offer an optional Guaranteed Winners Program that will award a prize to your organization’s highest scoring card each week. This short video explains the next steps to get started with our great FootballMania fundraiser. A great overview of CharityMania and how our fundraisers work. Use it when you are discussing CharityMania with others. This PDF contains the important facts, such as prizes, profit, and start dates for the $20 FootballMania fundraiser. This PDF contains the important facts, such as prizes, profit, and start dates for the $10 FootballMania fundraiser. Different fundraisers for different interests and times of the year. Our flagship game and most popular fundraiser. Choose between our $20 and $25 fundraisers. Game card holders can win prizes in all 17 weeks of the pro football season. You earn 70% profit with each CharityMania Ticket you sell. This $10 fundraiser offers all the same FootballMania excitement but takes place over a shorter duration of time. This is really helpful for schools and other organizations that start fundraising in the late summer or fall and need more time to sell tickets. You earn 65% profit with each $10 CharityMania Ticket sold. This popular, $5 fundraiser is based on the exciting “Squares Pools” games played during pro football’s championship game. Take advantage of this unique event and unique fundraiser to raise money! You earn 70% profit with each $5 CharityMania Ticket sold. The perfect fundraiser for communities that love college football. Choose between our $20 and $10 fundraisers. You earn 70% profit with each $20 CharityMania Ticket sold. Signup now for one of our FootballMania 2019 fundraisers.